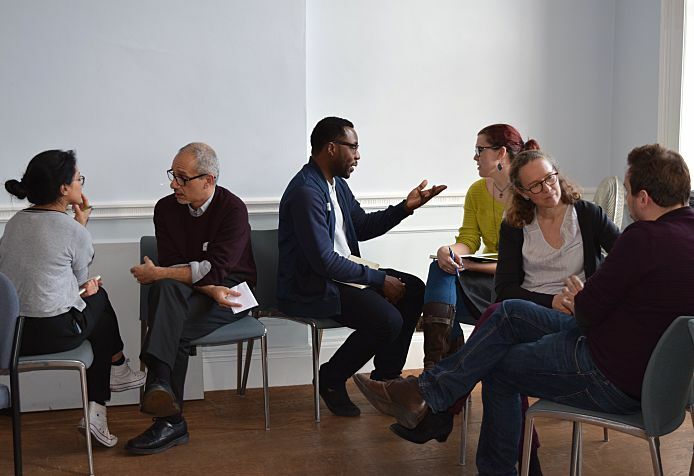 One afternoon at the end of January a wonderful thing happened: eleven artists brought together by the Gate, and eleven academics brought together by the Department of Development Studies at SOAS university, exchanged ideas. (SOAS University of London is the only Higher Education institution in Europe specialising in the study of Asia, Africa and the Near and Middle East.) They had 6 minutes to share stories and ask questions about the things that interest them the most, before moving on to the next conversation. It was, essentially, a speed-dating afternoon but replacing booze with sandwiches. The room buzzed with bursts of laughter, gasps of surprise and the hum of eleven intense conversations happening in close proximity. I dipped into the chats and overheard nuggets like “civil war is not always a bad thing” and “ ‘development’ isn’t worth the trouble” and “where is Keynesianism when we need it?”. (I needed to have the term Keynesianism explained to me – and then it all made sense…) I could almost literally see inspiration flying around the room, and am delighted to report that many of our artists have already followed up with the academics whose field chimed with their work. Why did we do this? Because I met the open-hearted Alfredo Saad Filho last year and we both realised that the Department of Development Studies at SOAS and the Gate share the same mission: to act as a loudspeaker for unheard voices from across the globe. We got excited about the idea of a partnership that can bring together in-depth academic understanding, first-hand fieldwork experience, and high-quality artistic interpretation, in the hopes of sharing hidden stories and challenging assumptions about how our world works, and why. Our plan is that in combining the global reach and expertise of SOAS Development Studies with the Gate’s intimate and well-known platform for debate and performance, we want to surprise and challenge ourselves and our audiences. We’re all hoping that this ‘Idea Exchange’ is just the start of something. The Department of Development Studies at SOAS University of London and the Gate Theatre in Notting Hill share the same mission: to act as a loudspeaker for unheard voices from across the globe. We are excited to explore a partnership that can bring together in-depth academic understanding, first-hand fieldwork experience, and high-quality artistic interpretation, in the hopes of sharing hidden stories and challenging received assumptions about how our world works, and why. Combining the global reach and expertise of SOAS Development Studies with the Gate’s intimate and famous platform for debate and performance, we hope to surprise and challenge ourselves and our audiences.